During the past few years, DuckDuckGo has managed to create a reputation for itself as the search engine that protects the privacy of its users. Today, it raised the bar further by announcing its new partnership with Apple. According to the report, Apple Maps will now be the default provider for all the local searches on DuckDuckGo and will be compatible with both – desktop and mobile web browsers. DuckDuckGo has also stated that the new partnership will bring improved address searches, additional visual features, better satellite imagery, and updated maps on their platform. The popular search engine did not disclose the terms and conditions of the deal and whether any money is changing hands between the two. Additionally, we are unsure whether DuckDuckGo is limited by the same “daily limit of 250,000 map views and 25,000 service calls” that Apple levies on the companies who use its maps on the web for free. Until now, Apple did not have much repute for providing tools that developers can embed into their web apps. However, the company announced an advanced tool MapKit JS at the Worldwide Developers Conference that DuckDuckGo would also be making use of. The MapKit JS works on the web similarly as it does in an iOS app, giving the developers ease of use to embed maps, add annotations, and create custom pins to identify places. 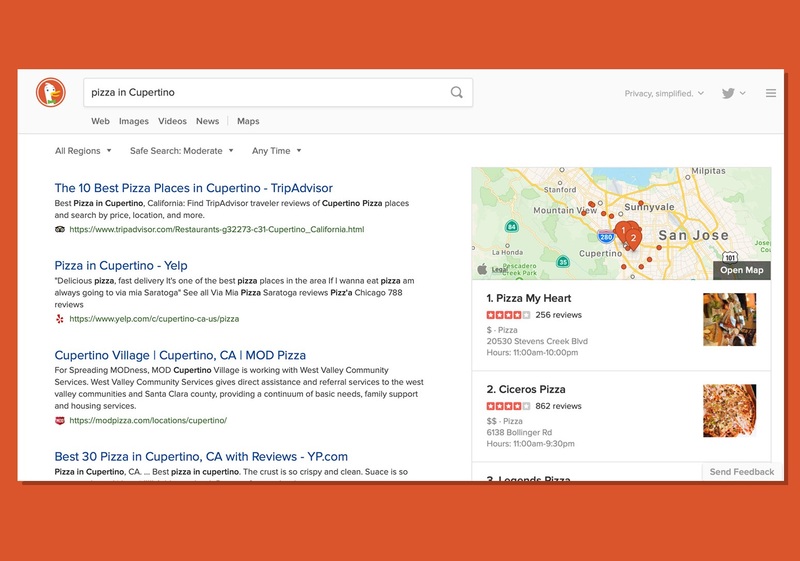 Before the recent collaboration, DuckDuckGo utilized a mix of different services to power its results while a query for street navigation meant getting a drop-down menu with options from Bing, Here maps, and Google. In fact, the company plans to continue using variety of providers, specifically Yelp for better user experience. However, Apple Maps remains to be its default source for maps and directions. The Apple Company also agrees to abide by the terms of DuckDuckGo and claims to protect privacy within Maps. Nevertheless, Google Maps remains to be the king when it comes to providing users with accurate and comprehensive local results. However, Apple seems to be working hard but will it be able to catch up to Google. Let’s wait and watch!